Recently we started the Middlewich Diary Photo Group on Facebook in order to give everyone an easy way to upload photos for possible inclusion in the Middlewich Diary. This has the added advantage of making the photos instantly accessible to all and also makes it easy for everyone to add additional information for all to see. Also, when time allows, we can post photos from our own vast collection of Middlewich pictures along with links to relevant Middlewich Diary entries and other websites and, we hope, stimulate discussion from Middlewichians past and present. In fact, some interesting discussions have already been started concerning the photos uploaded and we invite you to take a look and also join the group if you'd like to. Even if you're only an interested spectator it's a great way to learn more about Middlewich and we guarantee you'll find it fascinating. On September 7th 2015 Rex Edward Lees uploaded the above photograph to the Group. It's the sort of photo many of us have tucked away in drawers, in shoeboxes in the bottom of wardrobes, and in hundreds of other disregarded and forgotten places. Inexplicably, some local Facebook Groups which claim to be recording the history of Mid-Cheshire are scornful of school photos, with one group totally banning them. This we find hard to comprehend. Each battered and dog-eared school photograph you might find in some forgotten corner of your house is a record of a moment in time. Such photographs show the people of (in our case) Middlewich as they were with their whole lives before them, long before they became the people they are today. They're part of the history of our town. 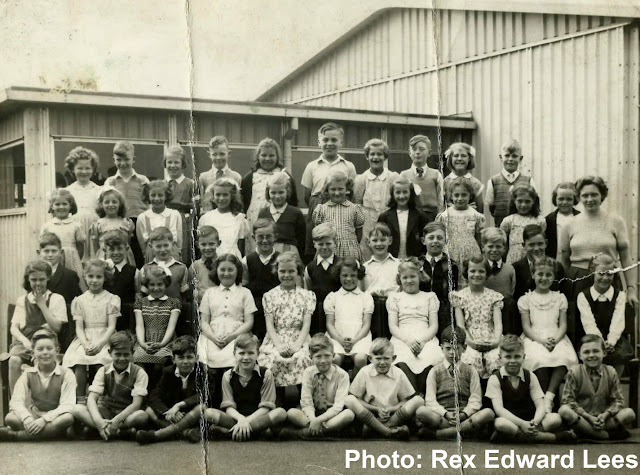 We welcome your school photographs, just as much as we welcome photographs of salt works, long-lost buildings, local events and everything else which goes to make up the history of Middlewich. *This was the description Rex used when he originally posted the photo. See update below -Ed. The teacher (right) is Miss Falkener and Rex has promised to supply the names of at least some of the pupils shown here. Perhaps you can help him out in putting names to faces? Park Road Infants School, as the name suggests, was at the end of Park Road, off St Ann's Road, and was on part of the site now occupied by the Willowmere Development. It was quite separate from the adjacent Park Road Primary School which has been rebuilt to form the Park Road School we know today. These pupils look too old for infants. I was at this school from about 1958 before moving up to Secondary School at King Edward Street. I remember the headmaster was a Mr Mathias. The infant school was on Lewin Street. My gran lived on Park Road with my uncle next door in the semi-detached houses before the terraced ones. I think Paul's right. On looking again these children do look a little old to be described as 'infants'. So this must be Park Road Primary School and not the adjacent Park Road Infants which, we assume, took over from the Lewin Street school when that closed - Ed. I was at Lewin Street Infants (very happy memories) then moved up to Park Road Juniors in 1963. There were two pre-fab buildings and, looking up Park Road towards the school, the 1st Years were in the smaller building on the left and years 2 to 4 in the main building on the right. Mr. Mathias was still the headmaster for the four years I was there, kindly old chap as I recall. The teachers in the main were rather crusty, dyed in the wool types until Mr. Corwood arrived fresh out of teacher training. His approach was very modern, setting up various extra curricular clubs, taking kids hiking etc. Although I didn't share his enthusiasm for footy he taught me chess, model making, stamp collecting, cheese and butter making, looking after various animals and how to pay attention in his class!